Sticking to the truest form of the original look of the tea shade 60s-style frames, these Metal and Watersnake sunglasses have an iconic look of their own. 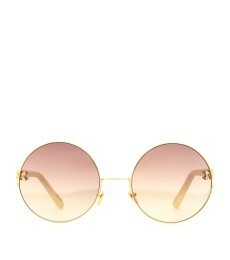 Perfect for adding a rock star element to your look, these circular sunnies by Linda Farrow Luxe are perfect for rockin out at all of your favorite outdoor summer night concerts. Channel Yoko Ono and pair them with a 60s-inspired top hat and all-black summer ensemble! Give em a try, with ViewTry!